I’m about to present to you a site so rare, so unheard of that it would be silly to miss it! Give yourself a pat on the back if you’ve been eying our Chapters coupon page and waiting for that big deal, because here it is! For a limited time, you can take advantage of totally free shipping with no minimum required. Since the minimum spending amount for free shipping is usually $25, this offer definitely takes the cake! Just think of all the possibilities you can get! 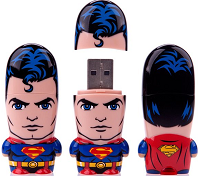 If all you wanted was this Superman USB key featured on the left for $25, you could get it! It’s not a bird, it’s not a plane: it’s your USB key helping you with storage! Treat that special someone with this Beer Shampoo at $18. Same great formula as that amber liquid you drink at home, but with fewer calories. Pair it with this Candy Cane shaped tea infuser for $12 and you’re ready for a party. If you haven’t started shopping yet, what are you waiting for?